Since I want to do some camping on my trip this summer (mom, are you reading this? If you are, I’m just kidding! ), I’ve got some “pre-flight” camping trips scheduled to test out my newer gear. Friday night was Camping Experiment #1, at Big Basin Redwoods State Park. Somehow I managed to talk Steph and Kim into camping with me, and I reserved a place for us via Reserve America. I arrived first and set up my tent and gear. I got hungry while waiting for Steph and Kim, so I cooked myself some Mountain House lasagna with my JetBoil. It came out pretty well — it smelled and tasted like Hamburger Helper — but the cheese really caked onto my JetBoil fork. I added “small sponge” to my packing list. Steph came bearing a full Coleman camping stove, so she made some turkey dogs. The only downside to the event was that the forecasted “low of 40” wasn’t — I don’t think it got below freezing, but it was definitely lower than 40. Anyway, I didn’t think I’d have a problem as my sleeping bag is rated 10F, but I was still freezing all night. All in all, a fun night and a great learning experience. Stay tuned for Camping Experiment #2 this Friday! 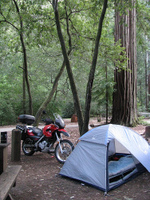 This entry was posted in Camping, F650GS. Bookmark the permalink. Hey, big fan of your blog and writings, I check almost daily (because I have no life!). Just wanted to say thanks to you and your friends for supporting the home team here. I see in your photo’s your sporting Streamlight headlamps in your camping gear. I work for Streamlight and just wanted to say thanks. That light should do well moto-camping, I think it’s the same one I use while moto-camping myself. Good Stuff! Keep up the ride reports, keep us posted on how the motocamping gear shakes out, I’m getting ready to do James Bay this summer myself. Hey, guess what. I found my sleeping bag today. I must have stepped over it sixty times in the last week alone and just completely blotted out its presence. Good Idea starting close to home and learning what does and doesn’t work. Soundrider.com and cyclefish.com both mave good info. Type “motorcycle camping” into your search engine and you’ll find alot of stuff. Camping brings a whole new twist to a ride.ENJOY! Sorry I won’t be skating with you this season!! Jennie, those look great! I’ll definitely check them out this summer (I’m doing more inland parks now before the weather gets too hot, then I’ll switch to the coast until fall).